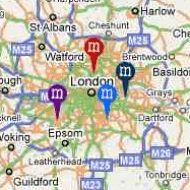 Posted bymurdermap	 February 28, 2013 February 28, 2013 Leave a comment on How safe is London? We were recently sent an email by a worried student asking about the likelihood of being murdered in London. This is perhaps not surprising given the prominence given to reports of teenagers being stabbed to death or shot. As we’ve repeatedly demonstrated, the number of homicide cases (both murder and manslaughter) has been going down steadily from a peak in 2003. Last year there were less than 100, which is returning to the levels last seen in the 60s and 70s. London may have more crime than any other area, but this is mainly because there are more people in London (approximately eight million). As you can see, if you rate different police forces by the number of murders per 100,000 people, London is only tenth highest, with the worst being West Yorkshire. Having said that, it is higher than the avarage for England and Wales. And if you look at it by country, then ‘England in Wales’ is doing better than both Scotland and Northern Ireland, although it’s some way behind Austria and even Italy. The country with the highest ‘murder rate’ is Lithuania – which is of interest given the increase in the number of people from that country now living in London and the rest of the UK. According to the Office of National Statistics, there were 74,000 Lithuanians in the UK in 2010 compared to 4,000 in 2001. According to the 2011 census there were just under 40,000 Lithuanians in London, although some believe the true figure may be double that. In some areas like Newham Lithuanians make up 2.7 per cent of the population. The recently-released figures for Homicide in England in Wales for the financial year 2011/12 (around 540 homicides in total) also contained a breakdown for gender and weapon (by percentage). As in London, most victims are male. It should also be pointed out that ‘stranger’ murders are actually quite rare. Most cases involve gang-related violence, domestic violence or fights at pubs or clubs. And while it’s always advisable not to walk alone in the streets at night, the likelihood of being murdered in London is very low indeed.